A look back at Squid Tales. A collection of Squidoodles based on some of the best known and loved works of authors and script writers across Squidland. Join our squids for a stroll down Literary Lane with a salute to some of the great classics that have entertained us for generations. 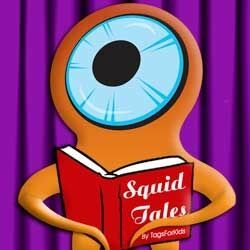 Whether they appeared on pages, or the big screen, I hope you'll enjoy Squid Tales. Why not start with the all time best selling novel? Seems like a revolutionary idea! "It was the best of tides, it was the worst of tides..."
...but at night, he turns into the legendary masked hero, Sqorro...defender and protector of the common squid against evil, and the perils of villainous officials! The town looks forward to the annual production put on by the amateur actors at the Squidville Community Theatre. This year features a hairy production based on the popular fairy tale, Squipunzel. Don Squixote and his faithful squire Squancho Panza, ride toward town with the wind at their backs. The family that shipwrecks together...stays together! Hounded by a mystery, Squerlock and his trusty sidekick Doc Squatson, accept an invite by the Baskervilles to investigate. It's a little more than elementary my dear Squatson, it's actually K-9! Looks like a 23 Squidoo is causing quite a flap! When Squarlet asked why his socks had holes, Rhett answered "Quite frankly my dear, I don't give a darn!". The Old Squid and the Sea. There was no way the old guy was going to throw this one back! Many didn't know Robinson Sqarusoe was an author who desperately wanted to be read....instead he was "marooned"! The biggest book of them all! The King takes the stand to watch his Knight of the Round Table go into battle! The works of Mark Sqwain. Squasimoto had a hunch about the town...and it rang true! The hills are alive with the Von Sqrapps in concert. Dedicated with love to my beautiful wife Angelica, who graciously tolerates my squidoodling! The old gang in the neighborhood decided to hold a block party...and it was a riot! This classic from Charles Squickens tells the story of Ebensqueezer Sqrooge, who receives an ominous warning from his deceased partner, Jacob Squarley. His evening is about to get a little tense with visits from Past, Present and Future! From comic books to TV to the big screen, Sqotham City has always been safe. When danger lurks, the mayor shines the BatSquid light in the sky, and summons the Caped Crusader! Just being nominated, and being one of the Top 100 Lenses for 2011, was an enormous thrill but I'm extremely pleased to say that after the voting we made the Top 11 Community Favorites for 2011! The actors, producers and stagetentacles all extend their most heartfelt thanks to everyone for their votes and bestowing such an honor to Squid Tales! If you enjoy these adaptations of the little one-eyed orange squid, then you'll want to take a look at some of these if you haven't visited before. Thanks! A lighthearted look at products in Squidville. A collection of Squidoodles based on the classics! A World Tour of nations, and the squids that inhabit them! Various Squidoodles requested or inspired by other Lensmasters. The most famous town in the Squiddom, where the only thing with two "i's" is the name! The first collection of squidoodles, and the start of many to follow. Squid Art Too....the "Sea Quell". Be sure to tour Squidville's famous museum. Today, entrance is free! A moving tribute to the Squidoo mascot and logo! Join the Squidkley household for the annual reading of "The Night before Squidmas". A little background to my squidoodles. A lens featuring the Purple Star Awards, along woth purple squidoodles! SquidArt by Steve Thompson / tagsforkids is licensed under a Creative Commons Attribution-Noncommercial-No Derivative Works 3.0 United States License. Squidoo logo is a trademark of Squidoo LLC. Graphics, Squidart and Squidoodles Â© 2009 by tagsforkids (Steve Thompson) . Some rights reserved. This work is licensed under a Creative Commons Attribution-Noncommercial 3.0 License. You may use these Squidoodle images for lenses, but not for commercial use (i.e. you can not sell them or use for advertising products), as long as you include credit and a link back to the Squid Tales lens. Please note that I am not affiliated with, nor endorsed by Squidoo LLC. Thank you. I'd love to hear your comments and suggestions for more works! My! My! My! Excellent piece of work ! This article is hysterical!! Love it, love it, love it!! Great job! Ah, I was just thinking about that old squid and the sea. Hugs across those miles. I was cracking up at the pictures...I love how the non squid animals only have one eye too. u made my day :))) great work ! GREAT lens!!!! Wow!!! Super cute! Blessed! Wow, in awe you put this together so well. Bizarre, humorous and fun! LOL! I haven't laughed this much since Squidtember. Blessings. You had me at "It was the best of tides." Hilarious lens! A great love for this lens! Where's Robin Squid? From Nottingsquid lake? Oh way too sweet! Blessed. What talent! What tentacles! I especially like "Gone with the Tide". You should get the award for Squidnimation! I love it. This lens is like the TV show Wishbone for Squidoo. Some other ideas to parody: Where In the World is Carmen Sandiego, Where's Waldo, MC Escher, Mandelbrot Fractals, World Dictators, Super Heros, Politicians, Comedians, Kings and Queens, America's Most Wanted,...I could go on and on...if you implement any of these, please post a link on my profile so I can check them out and share them with others. Very awesome and clever, clever, clever! Very entertaining for big kids too. I liked squid-hippie, made laugh! I love the pictures....very creative lens! Lol, cute. Thanks for the laugh. A day brightener indeed. Very creative and witty. Thanks for sharing you squidoodles. Those were some good ones! So funny, I loved the squid stories, reminds me of bedtime tales. I love it! I appreciate the laugh. Blessings! AMAZING and So Creative!!!!!!!! Superb job on this lens!!!! hahahahah Can't stop laughing. You are so creative and a wonderful sense of humour. Blessed and featured on Blessed by Skiesgreen 2012. Hugs. Absolutely delightful and blessed for creativity that just seems to abound. I don't remember posing for the old hippy but I seem to remember that headband! What a squidprise it was to find my favorite squids here in a squidoo lens. Wow. Great lens! Keep up the good work! thumbs up! So creative and fun! Blessed and congrats to the top 11 for 2011. Adding to " Top 11 Squidoo Lens for 2011" Module of My Squid Angel Wings lens. A bit creepy but still very cute. You have amazing art abilities and crazy imagination. Love them! Your lens is a Whole Lotta Fun! Congratulations on being one of the top 11 in 2011! Congratulations!!! Have a great year. What great fun. Extremely creative. Tops in its field. Best I've seen yet. Applause , applause to the squid-actors! Bravo! LOVE IT! Blessed, tweeted, and everything else. Very clever and fun! Enjoyed visiting this lens very much. Hysterical and very clever. You are a talented graphic artist (with perhaps a tiny bit of a warped sense of humor?!?). :) Congrats on being selected as part of the Top 11 lenses of 2011. Ohhh my goodness you are clever. This is so unique and creative, just love it. Congratulations! Magnificent! Congratulations on your well deserved Top 11 award. Very well deserved! You have talent and a sense of humour - these are such fun! Congratulations on being one of the Top 11 in 2011! You are a talented graphic designer, no doubt about that. Happy New Year! Congratulations Top 11 of 2011. This lens certainly earned it's spot. Super work. You are so creative. Blessings. "Old Squid and the Sea," ha, do you carry a note pad to document your ideas when you aren't creating these? Don't let the good ones get away. Congratualtions on your nomination for Community Favorites AND for making the MONSTER BOARD! I absolutely love your illustrations! I think my biggest giggle was the Old Squid and the Sea, but because it is the season, I also enjoyed a Squidmas Carol. bravo for work well done! I am adding you to my list of favorite lensmasters I follow. Happy New Year! Congrats on the placing on top 11 lenses of 2011. I could have sworn I'd blessed this - rectified now. Congrats on your lens for 2011. I hope we see more in 2012. Happy New Year! This is so cute! Love it! Gone with the Tide and Mark Sqwain are my favs, I think. Congrats on the top 100. You so deserve it!! Congrats for making the top 100. This lens deserves it. Stopped by to say congrats on making the Top 100. I see why. This is such a cute page . I love it. Best wishes for the New Year. These Squidoodles are soooooooo cute. Congratulations on being one of the final 100 favorite Squidoo lenses of 2011! I have a warm place in my heart for the one-eyed basset hound. As usual, squidooles prefected! Congrats on making the top 100! Hope we both do well in the voting. Love Gone with the Tide! Lol! Congrats on making the top 100! These are awesome! Only missing Hans and Squidchen and maybe Beauty and the Squid? :D Fantastic work. So much fun! Wishing you a happy and healthy new year. Love these Squid Tales, they deserve a BIG hand! Definitely the actors deserve a Squidhand! Squidplause to all! Very clever and enjoyed the artwork. Congratulations on being in the top 100. I look forward to more Classics. Very, very clever. Totally enjoyed the Squid Tales. I can see why it is in the top 100. You are so creative and talented. Congrats on being in the top 100 Community Favorites. I love your work,but hadn't seen this page yet. Clever! My Favorite was "Gone with the Tide." That was just too cute! Inspired by your squid tales, Steve!